VIDEO: Council officials say main contractor on trams project could be dropped after it announced 30-month delay on troubled works. 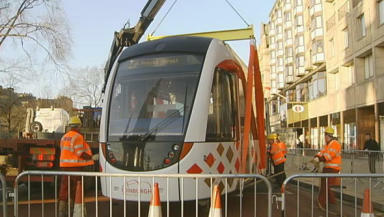 Edinburgh council may axe the contractor behind the city's new tram network over revelations that work may now not finish until 2014, it has emerged. The local authority held crisis talks on Wednesday in a bid to end a year-long dispute which has seen workmen down tools on a number of construction sites. The latest statement from the contractors, German firm Bilfinger Berger, says work, which has already been heavily delayed, could now be delayed a further 30 months - a wait that angry council officials brand "entirely unacceptable". The £545 million project is already running two years behind and the council says further delays would have serious financial implications. After the meeting, transport convener Gordon MacKenzie blasted: "For us it's completely unacceptable. We've had external experts look at the programme and they tell us, quite clearly, the project is deliverable within 2012. This figure, 2014, is absolute nonsense. "We've got to take them to task on this through the contract. We believe it's absolutely unjustifiable, the figures they are putting forward for this, and we're going to use every power that we can within the contract to bring them to a sensible position on the contract, time and cost." Transport chiefs are now refusing to rule out ditching the main contractor halfway through the project. However, that could result in the city facing costly legal action. Following Wednesday's crunch talks, Edinburgh Trams Board chairman, David Mackay, said: “My concerns and those of my fellow directors are for the people of Edinburgh who have continued to suffer from these seemingly endless delays. "I am genuinely not in a position to talk in detail about the confidential aspects of today’s meeting – this is for reasons of commercial sense. However I can say that today we have been presented with a series of options by the management team." He added: "While the board will continue to seek a reasonable negotiated outcome to all matters in dispute, the clients’ rights will be strenuously safeguarded. Our stakeholders are entirely unified in the resolution to apply the full terms of the contract. The conflict began last February over changes to the project and claims of added costs. Workers downed tools on Princes Street for a month while track laying work in the city's West End has also been halted. Long term critic and Lothians MSP Shirley Anne Somerville said the latest developments were incredibly worrying. She told STV News: "I think the public should be very concerned because there is going to be a funding shortfall, and that shortfall is going to be made up by the taxpayers in Edinburgh." However, she added: "One thing is certain, we need the work to start in Edinburgh city centre as soon as possible. Whether people were for the trams or against the trams in the first place, this is doing no good for our capital city. We need to see people back to work and we need to see that as quickly as possible."